Distributor / Channel Partner of a wide range of products which include gear oil, tap oil and hydraulic oil. We offer 'SUPERCLEAR EP' Gear Oils, which are specially designed to use in industrial enclosed gears operating under moderate to severe working conditions. It is blended with highly refined base oils and various additives to protect from wear, load, corrosion and oxidation. It has got clean gear performance under conditions of high temperature and oxidation. SUPERCLEAR EP gear oils have got excellent load carrying properties, preventing the formation of sludge/varnish and promote clean gear performance. These oils have got good thermal stability, low foaming tendency and excellent demulsibility characteristics. * Excellent phosphorous retention improved and extended wear protection. * Superior Extreme - Pressure properties. * Control the formation of sludge & Varnish thus clean gear performance. * Special chemical prevent the formation of sludge / varnish. * Strong micro pitting performance. * Reduces overall consumption and waste. * High resistance to oxidation. * Good demulsibility and corrosion protection. * Resistance to foam generation. Available in ISO Grades: 100, 150, 220, 320, 460. Packing: 20LTR CAN, 208LTR BARREL. 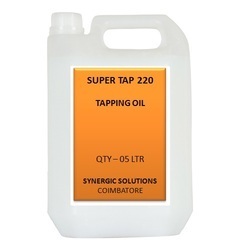 We offer mineral based; high performance Tapping Lubricant. It has got excellent lubricating, cooling and anti-welding properties. * Reduces friction and wear to ease tapping and increase tool life. * Designed to meet the most stringent requirements for all machining operations. * It is free from chlorine and hazardous materials. We offer 'SUPERON' make 'SUPERCLEAR AW' Hydraulic fluids are blended from high quality hydro paraffin base oils with superior antiwear additive package having excellent demulsibility characteristics, improved deposit Control , cleanliness and detergency properties to meet the requirements of various international standards including DIN 51524 part 2, ISO 11158, Parker, Eaton, Bosch Rexroth etc. Eg: Plastic injectionsmolding machine, mobile hydraulic systems It has got excellent oxidation stability, superior wear protection, improved corrosion protection and extra cleanliness and deposit control. • Excellent anti wear Properties Increased pump life due to minimum wear of hydraulic pump sand moving components. • Excellent Demulsibility lower maintenance cost due to immediate water separation. • Improved sludge and deposit control: Clean hydraulic operations. .• Good foam resistance and maximum protection from corrosion. • Hydraulic systems of plastic injection molding machine. 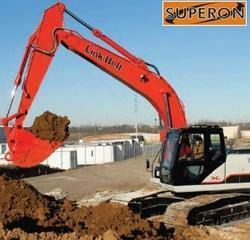 • Hydraulic systems on dump trucks, bulldozers and forklifts. • Hydraulic presses, jacks and punches in machine shops. Available in 20 LTR & 208 LTR Packing. SUPERCLEAR AW hydraulic fluids are unlikely to present any significant health or safety hazard when properly used in the recommended application and good standards of industrial and personal hygiene are maintained.